Arbor Day in Bowling Green (2017). In the 1990s, the city of Bowling Green recognized that having a strong, healthy urban forest can lead to economic growth, improved human health, and a safer and more enriched community. Research published by the U.S. Forest Service, for example, noted that along with many social and aesthetic benefits, shoppers reported more frequent shopping, longer shopping trips, and a willingness to pay more for parking and goods in tree-lined commercial districts. Vibrant, green communities not only attract business, they draw in individuals who want to live there. In 1994, Bowling Green, worked with the Kentucky Division of Forestry (KDOF) to become a Tree City USA® community, a national program administered by the Arbor Day Foundation that recognizes cities for their excellence in urban forestry management. “On a daily basis, Kentucky Division of Forestry staff provide technical information about trees and forests, including proper management and species selection. There is no greater moment of education impact than when you hand a tree seedling out at an Arbor Day event and talk to people about their new tree,” says Sarah Gracey, urban forestry coordinator for KDF. To achieve this status, Bowling Green met the program’s four, core urban forestry standards: maintaining a tree board or department, having a community tree ordinance, spending at least $2 per capita on urban forestry, and by celebrating Arbor Day to help raise public awareness about the importance of community trees. The city hired a full-time arborist to manage trees and forests within the city, and the tree advisory board advocated for urban forestry through educational efforts and annual events during which it educated the public about the benefits of well-maintained trees. Bowling Green is an excellent example of how partnerships can make lasting positive changes in communities. These partnerships are most evident during the city’s annual Arbor Day event, co-hosted by the city of Bowling Green, Western Kentucky University (WKU), Bowling Green Municipal Utilities (BGMU), Lost River Cave, Greenways Commission, Warren County Conservation District and Warren County UK Cooperative Extension. The event is used to increase public knowledge of the importance of planting street trees, planting the right tree in the right place, and showcasing the city as a model for how a healthy urban forest benefits the community. During the Arbor Day celebration, Bowling Green distributes 1,500-2,000 trees, which are grown by and purchased from KDOF. These seedlings provide an opportunity to discuss with citizens the importance of proper tree selection and the benefit of trees. Along the journey to becoming a greener community, Bowling Green recognized opportunities to update city regulations and to educate the public. “The city has updated their street tree ordinance,” said Jared Weaver, Bowling Green City Arborist. “The ordinance contains a list of nuisance trees that are not allowed to be planted in public right-of-ways due to thorns, messy fruits, disease problems, or high potential for invasiveness. Weaver and his part-time assistant oversee more than 1,000 acres of managed parks, which has improved and grown through the effort. “We plant at least 200 new trees each year,” he said. Additional urban forestry efforts are evident in the community’s in the Tree Line USA® program, another national program administered by the Arbor Day Foundation. After a 2004 windstorm caused severe power outages due to trees falling on power lines, Bowling Green Municipal Utilities (BGMU) realized that changes needed to occur. “BGMU began by training their tree trimming crews to properly prune trees under and around power lines, instead of just topping them,” said Danny Heltsley, BGMU right-of-way foreman. Tree topping is the indiscriminate cutting back of tree branches to stubs, which weakens trees, making them more susceptible to insect and disease problems, and shortens their life spans. “Topping creates hazard trees, but proper tree pruning creates healthy trees,” Heltsley said. Since the utility began using proper pruning techniques, the rate of tree-related power outages has dropped from 120 to 20 occurrences a year. According to Heltsley, that is a significant cost savings and customers are taking notice. In an effort to help promote the “Right Tree, Right Place” program, BGMU is continuing its partnership with the Bowling Green Tree Advisory Board on a “utility friendly” tree-tag campaign. BGMU has purchased bright green tree tags that display the logos of both the tree board and BGMU, with the wording, “utility friendly tree.” It is working with local nurseries to attach the tags to trees that will not interfere with power lines when they reach maturity, trees with a maximum height of 25 feet or less. BGMU also asks customers to plant trees a minimum of 10 feet from overhead power lines outside the utility easement. Western Kentucky University (WKU) also is another avid partner in Bowling Green’s green campaign. . Seven years ago, the university became a Tree Campus USA® member, an additional recognition program administered by the Arbor Day Foundation. Past University President Gary A. Ransdell made tree planting a priority during his administration by planting three trees for every one that was removed. Due in large part to his efforts, one of the most visible changes at WKU over the past 20 years has been the transformation of its 207-acre campus. These changes have led to WKU’s entire campus being recognized as a nationally accredited arboretum, home to more than 3,400 trees spread throughout the main campus with more than 31 miles of self-guided walking paths. The Felts Log House sits next to the Kentucky Library & Museum on Western’s campus. WKU is also a real-world classroom, according to WKU Arborist Leah Hopwood. The Department of Planning, Design and Construction, in partnership with the Department of Grounds, and the Department of Geography and Geology has created a digital campus tree inventory. David Evans, a student studying geography, created the inventory in 2009 with the assistance of the staff from the Department of Facilities Management. Evans collected data, marking more than 3,400 trees on the university’s main campus. He noted tree species, size, and Global Positioning System coordinates. The Office of Planning, Design, and Construction supervised the data collection and currently manages the project. Centennial Mall located on WKU campus. The inventory is available as an educational tool for the university and campus community and can be found via web-based, read-only access at https://www.wku.edu/bakerarboretum/documents/inventory1_17.pdf. “The tree inventory is a valuable planning tool for managing our urban forest, including the maintenance of existing trees and placement of new trees,” said Hopwood. Bowling Green’s urban forestry efforts over the years serve as an example for other communities in Kentucky. Through sustained partnerships, dedication, long-term planning and investment, the quality of urban life continues to grow, which benefits all who live in or near this community. 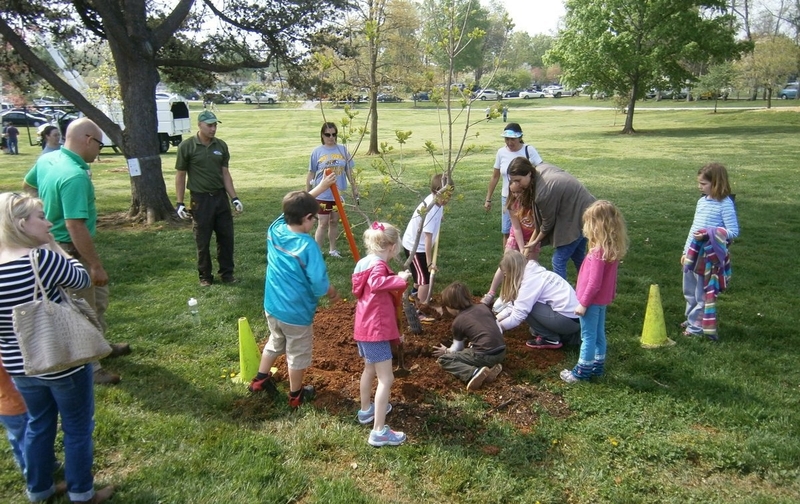 For further information on urban forestry assistance in your community, or the Arbor Day Foundation programs, please contact Sarah Gracey, at 502-782-7161 or by e-mail at Sarah.Gracey@ky.gov. You may also contact Bridget Abernathy, Urban Forestry Partnership Coordinator at 502-782-7176 or by e-mail at Bridget.Abernathy@ky.gov.